I just came back from a 10.22km run on the hemada, and it didn't really go that well. Something seemed to be not quite right from the moment I set off, and my speed was much lower than it would have usually been for the same level of effort. In fact it took me well over an hour, which is very slow despite the fact that I was not pushing it (1 hour 8 minutes and 28 seconds). I would usually manage it in under an hour even at a really casual pace. It was only after a few kilometres that the familair grumblings that signal a stomach bug started to occur. It shouldn't have come as too much of a surprise because one family that stayed at the hotel were sick and then after that one of the staff got sick. So it seems I was next in line. I managed to see a nice lake in the middle of the hemada before my big problems started. On the way back from the lake I was having to stop for toilet breaks every few minutes or so. 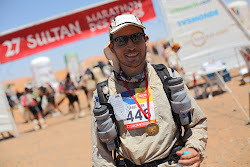 In fact it is very lucky that I changed my mind at the last minute and decided instead of running to Merzouga centre to run into the middle of the hemada. Otherwise that could have been extremely embarassing. I finally made it back to the hotel and went straight to my room. Hopefully it will be over quickly and I will be fine by tomorrow, fingers crossed. I have reserved the sauna for tonight, but considering my fragile state I will limit the total time to under 30 minutes and take frequent breaks to cool off.